Like any piece of complex machinery, electric garage doors can pose some serious safety issues if they are not properly looked after. There is no doubt that they do make our lives a lot easier, but without proper maintenance, these wonderful systems can turn into something unnecessarily dangerous. Here are some basic routines that you should adopt to make sure your automatic garage door stays safe and functional and lives up to its full potential. Regardless of what kind of door you have, it is always essential to keep a close eye on the condition of the springs that are attached to it. Springs have a very important job, as they support the weight of the door itself, balance it, and provide the tension that's needed to help the opener (or you) move it easily. You need to check these components for signs of rust, deformed coils, and tiny stress fractures. 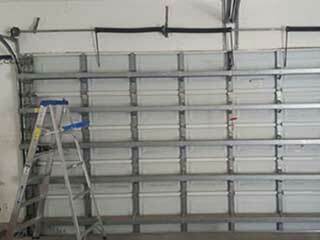 If you need to have a garage door spring replaced, but you have more than one of them, it is unwise to leave the rest and only have the damaged unit tended to. The condition of the other ones can't be too far off, and a broken spring is far too dangerous to risk it. Get these components checked by our experts at the first sign of trouble to avoid more dangerous and costly scenarios. With automated door systems, it is absolutely essential to test out the various inbuilt safety features that your opener comes with. First, you should make sure that the safety sensors are working correctly. The safety sensors use a beam of infrared light that will stop the door's motion when it is interrupted. To test it out, all you need to do is wave something in front of the beam while the door is closing. A broomstick would probably do the trick. If your opener doesn’t stop and reverses the door, then you’ll need to have the sensors checked as soon as possible. This function should also be tested by placing an object under the garage door as it is closing and seeing whether it reverses when it touches the object or keeps trying to close. If the feature works correctly, then the door should stop and reverse itself at the first sign of resistance. If it doesn't, then your opener might need some repairs. Checking these things on a regular basis will help you avoid all sorts of problems and keep your family safe. When you find some part of your door is starting to malfunction, give our experts at Garage Door Repair Norwalk a call. We'll gladly fix it for you!